Includes: bra, skirt, arm bands, wrist cuffs, necklace, half-circle chiffon veil. 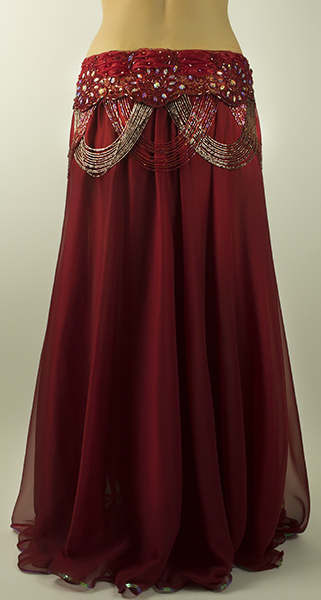 Fabric: burgundy chiffon, burgundy lace, skin color lycra. Beading: burgundy, skin color, huge AB stones. Skirt+belt: full chiffon skirt with one slit. Belt attached to the skirt. Belt: 38" from end to end, set at 35". Skirt length: 39".